Before the 1860s when the most noted invention of the typewriter was created, two other historical men had come up with similar concepts. The first of these individuals is Henry Mill who, in 1714, was granted a patent in England to design a writing machine, which he planned to create as a means to transcribe letters (The earliest writing machines, 2000). However, after his invention did not come to light, years later in 1843, the second patent for a mechanical writer was issued in the United States to Charles Thurber, which he used to develop the first practical typewriter. Yet although he was successful in its creation, it too ultimately failed (Abraham, 1980). After that there were other attempts made to replace the pen by building a mechanical writing machine, but the first commercially successful modern typewriter was invented in the early 1860s by Christopher Latham Sholes with the help of his chief lieutenant, Carlos Gidden. While Sholes spent years building several prototypes, it was his final version that featured a revolving cylindrical plate, inked ribbon and the QWERTY key arrangement making it more functional and reliable (Anonymous, 2011). From there, Sholes partnered with James Densmore to assist in the marketing but unfortunately they were unable to overcome their debt so eventually in 1873, decided to keep the rights of the patent and turn over the manufacturing to Remington (Kohlmeyer, 1956). In doing so, the New York company started mass producing the typewriter and turned it into a best-selling model because by the mid-1880s the Scientific American reported over 40,000 machines had been sold (Mattox, 1997; Jensen, 1988). As sales continued to flourish, the typewriter had become regularly used in the United States and abroad by government offices, businesses, banks and others. Around the same time, other manufacturers entered the market such as Underwood with a competitive best-selling model in 1895 and L.C Smith Company in 1904 (Mattox, 1997). Through all of this what prevailed was more than a useful machine as its presence in the United States led to long-lasting changes like document legibility and professionalism, production efficiency, standard management systems and professionally trained skills, all of which significantly impacted the way people communicated then and still do today. 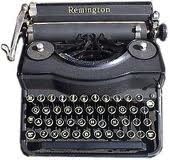 Among other changes, one substantial difference that the typewriter offered in comparison to handwriting was that it allowed for any document produced with its use to be more presentable. In particular, what this meant was that regardless to the type of text being written, whether it was a report, record or letter, each finished product followed a consistent format so that it would be more clear and organized on the page and more legible to the reader. This occurred because instead of documents being written by hand wherein every person has a style of writing unique to them, causing the letters on the page to appear slightly different and even perhaps difficult to read, the typewriter required a standard set of alphabetical keyboard letters to be used so as to ensure the text would appear exactly same each time it was entered, no matter who was typing. Other presentation modifications that the typewriter utilized were that it applied standard pre-set dimensions on the page to ensure there was sufficient spacing around the text, between sentences and among each letter (Jensen, 1988). In some respects, the textual variations the typewriter created may on its own seem important but not necessarily groundbreaking. However, when put into context, the influence was that much greater since it was largely from the perpetuation of document standards that presentation continued to become more highly valued, thus it can be said that the typewriter inevitably took the meaning of professionalism to new heights. To exemplify, one societal sphere in the United States that this revolution significantly affected was in the world of business and commerce. Even though companies were often run differently depending on the nature of their business, certain overall improvements in business communication had become typical such as an increase in documentation and record keeping for memos, contracts, invoices and other billing needs. As well, most if not all of those records had multiple carbon copies made and were forwarded to those whom which it was relevant (Kohlmeyer, 1956; Boyer & England, 2008). Over time, these practices in communication and professionalism became so commonplace, that writers like Wright Mills (1959) used the term ‘the enormous file’ to describe those company offices, which he said “produces the billions of slips of paper that gear modern society into its daily shape” (Boyer & England, 2008, p. 247). Eventually this view came to be held by most and with it the realization that the development of the typewriter and its rise in professionalism and other benefits was the way of the future. At the same time that standardized document formats from typewriters was flourishing, so too were other meaningful improvements in communication. One such advancement was in regards to efficiency and the rate at which information was shared since typing was much less time-consuming than handwriting and data could be communicated much faster. While this new found possibility was quickly popularized in many aspects of society, it became the most embedded within businesses and the government. In fact, it had such an effective and positive impact that “between 1897 and 1907, as an illustration, messages processed by State annually rose over 150 percent, from 37,000 per year to 94,000” (Mattox, 1997, para. 5). From this, standard communication management systems began to be put in place in many offices, forever changing the way work was organized (Lubar & Kendrick, n.d.). More specifically, what many soon started to understand is that in addition to minimizing their own time and effort spent on document creation, if standardized procedures were put in place and skilled operators were hired to rapidly type clear and presentable uniform documents, than the ability to give other tasks more attention would prevail thereby making the entire process more efficient and productive (Anonymous, 2011). Although the formation of communication management systems was in itself a major feat, the impact on professional skill building through the role of the secretary and feminization that ensued is still today widely recognized. That is, as administrative work continued to be done with the typewriter, it also came to be seen as less important for men in terms of growth in their career (Boyer and England, 2008). As such, the position started to only be filled by women so that by 1890 approximately 45,000 typists or secretaries were female (Lubar & Kendrick, n.d.). Yet, even though being a woman had its advantages, only those who possessed the desired skills were hired. Consequently, in 1881, organizations like the Young Women’s Christian Association in the United States started to offer training courses to teach women how to become professional typists. Then, as the number of students rose, other typewriter manufacturers like Remington started opening schools of their own (Typewriters, n.d). In turn, it was with these expert skills many women became educated, empowered and valued in the workplace (Jensen, 1988). In looking back it is apparent that the invention of the typewriter truly holds a lot more meaning than simply a useful device. By influencing the way documents were presented, professionalism rose; by improving typing speeds, efficiency, standard management systems and the role of the secretary was established. Taken together, it was from the typewriter that vital communication changes still in existence today were born. Abraham, T. (1980). Charles Thurber: Typewriter Inventor. Technology and Culture, 21(3), 430-434. Anonymous. (2011). ASME Honors Sholes & Glidden Typewriter. Mechanical Engineering, 133(12), 78. Boyer, K. & England, K. (2008). Gender, work and technology in the information workplace: from typewriters to ATMs. Social & Cultural Geography, 9(3), 241-256. Jensen, J. (1988). Using the typewriter: Secretaries, reporters, authors, 1880-1930. Technology in Society, 10, 255-266. Kohlmeyer, F.W. (1956). Review of the typewriter and the men who made it. The Journal of Economic History, 16(1), 69-70. A great summary of the typewriter! I had no idea that the QWERTY keyboard had been around for such a long time. I thought your summary of the division of work that resulted from the introduction of the typewriter was insightful and reflects a stereotype that unfortunately, still exists today. I noted with interest last week, this quote from Bush’s article written in 1945. 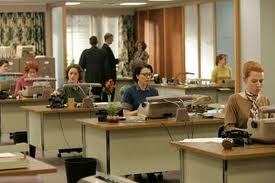 I wonder what the gender statistics are today for secretaries? We certainly would not assume that they would all be women!